Take Me home a must have book for all the Students or people who are interested in entrepreneurship Motivational stories, Take me home has 20 inspirational stories of Entrepreneurs from Small towns in india with Big Dreams, and how they chase their dreams. Take me home is written by Rashmi Bansal. The Regular Price of the Book is around 140-150 Rs, but you can buy in just 100 Rs from this Amazon Offer. MRP of the Book is 200 Rs. in India. 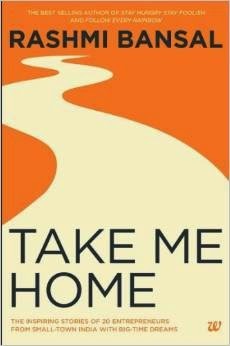 Click here to Buy Take me Home from Amazon in 50% Discount. You will find some Great Motivational Quotes and thoughts too in the book, which you can utilize in your own business idea or in your life. Take me home is one of the book, you can't enjoy while reading online by downloading pdf or getting free pdf book from your friend or some google source. So, you can easily buy with the highest discount available ont Rashmi Bansal's Take me home witht he above link.